After the question has been popped and the date has been set, a pivotal wedding plan­ning question inevitably rears its head to a couple – should we have a big wedding or a small wedding? There are benefits to both, no doubt, as well as drawbacks. 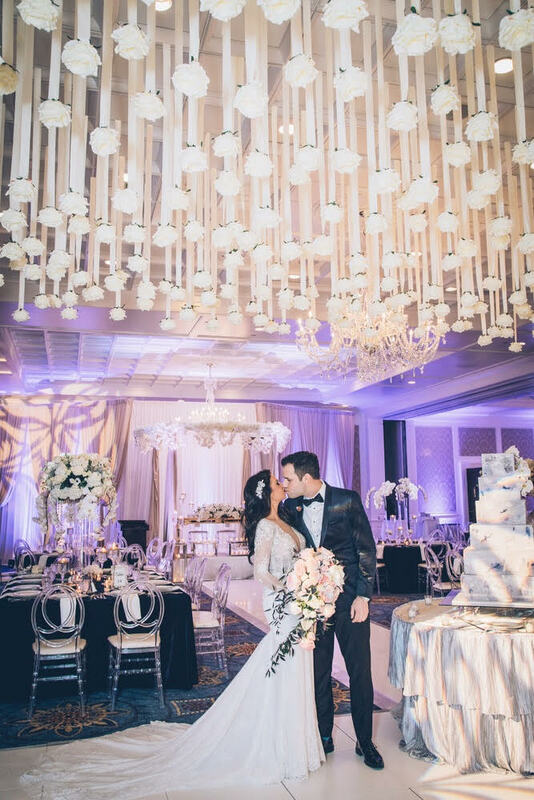 To help an engaged couple with the decision, Lawrence Yaldo and Andrew Kaina from Top that Table in West Bloomfield and June Abro from A June Event also in West Bloomfield lay out the pros and cons to each. But before the comparisons begin, what ex­actly constitutes a small wedding? And what ex­actly constitutes a large wedding? “The comparison between a small wedding versus. a large wedding differs amongst different cultures. For instance, a small Chaldean wedding would be considered un­der 300 people and more than 500 for a larger wed­ding. However, in some cultures, a small wedding would be considered under 150 people and more than 250 for a larger wedding,” said Yaldo. “Having a smaller guest list opens your options to many venues. There are fabulous event spaces all around Michigan that offer a unique ambiance when hosting a smaller event,” said Yaldo. “How­ever, it can be crucially hard to narrow down your guest list when trying to have a smaller wedding. Many individuals may be offended if not invited which can create conflict. Having a big wedding can give the flexibility of not excluding anyone from the guest list,” said Kaina. Couples who choose to have a large wedding may wonder how they can still keep the ambience intimate and personal. “There are a couple of options that a couple can have when it comes to this. For in­stance, a couple can choose to have a small wedding ceremony and a larger wedding reception,” said Kai­na. “A destination wedding ceremony is a great way to be surround yourself with those that are nearest and dearest to you. The couple can host a post wed­ding reception upon their return home to celebrate with the rest of their friends and family. Another op­tion would be only extending a ceremony invite to your closest family and friends while extending a re­ception invite to everyone else,” said Yaldo. If a larger wedding is what a couple decides upon, then there are ways to cut down on costs. “If you are having a large wedding, you may want to consider a smaller bridal party. This will save costs in a variety of ways, including rehearsal din­ner bridal party gifts,” said Abro. “There are a lot of cost-saving methods that couples can use to save on their wedding. One of the biggest is choosing a wedding date that falls in an off-peak season. Many venues offer incentives or discounts for weekday bookings or winter bookings. Another great cost-saving tip is doing it yourself if you can. Items such as favors, wedding programs, and invitations can be a fun DIY and cost-effective project if you’re crafty and creative,” said Kaina. When it comes to venues, Metro Detroit is rich in offerings – both for small and large weddings. “For small weddings, the Westin Book Cadillac, Colony Club and Townsend Hotel offer great ambiance with a unique and tasteful touch,” said Yaldo. “Having over 450 guests limits couples to a handful of venues such as Shenandoah Country Club, Penna’s of Sterling, and Palazzo Grande. These venues have an outstanding ability to ca­ter to more than 450 guests, easily giving your guests the wedding experience of a lifetime!” said Kaina. No matter the size of the wedding, the locale, or the season, what matters the most in all of the decision making is the mutual, unwavering love a couple shares for one another. Photos in this article courtesy of Sarkis Photos, Futurewave Images, Anthony Samona of Quik Pix, and June Abro.